The official baseline release can be found here. Click “Add” and choose the “Speculative Execution Side-channel Vulnerabilitiesv106.cab” downloaded from the link provided in the article above. You’ll notice the following error, assuming that’s ok with you, choose “Yes” and continue. 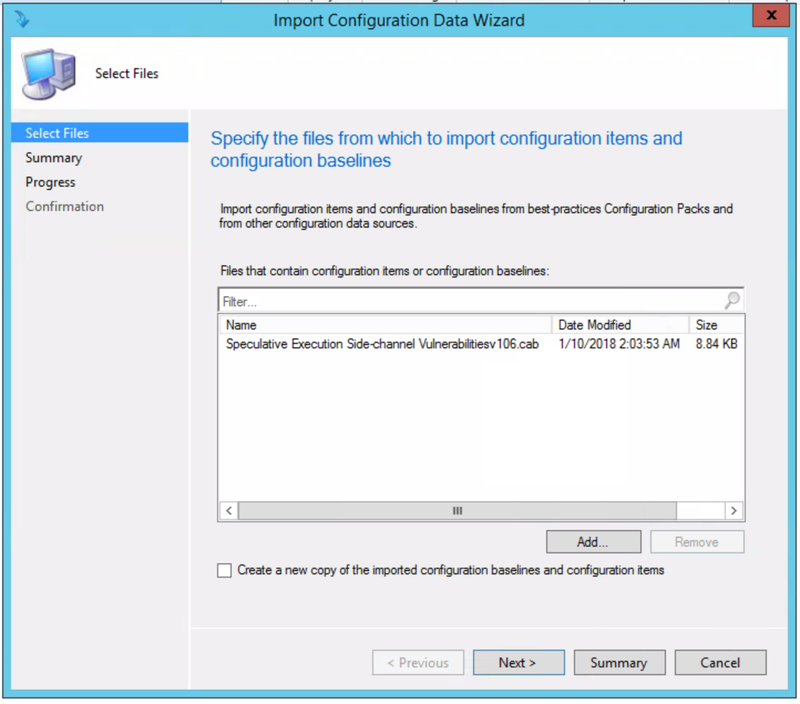 Close the Import Configuration Data Wizard once it finishes. You’ll now see the following under Configuration Baselines in the folder where you Imported it. Now that we have the Configuration Baseline added, our test collection created, we can deploy the Baseline. 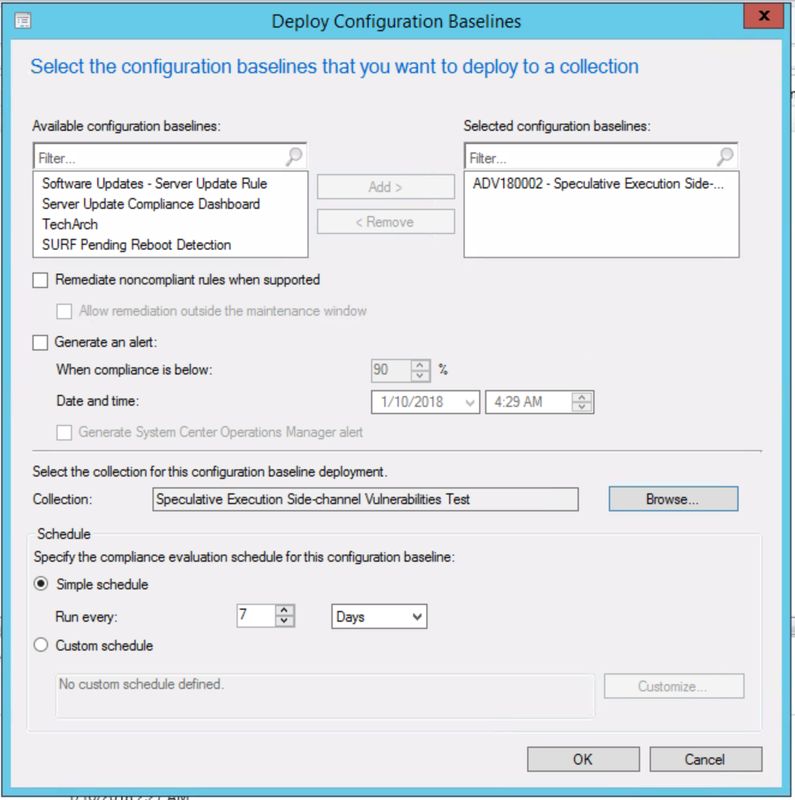 Head back to Assets and Compliance > Compliance Settings > Configuration Baselines, right click on the newly created Baseline and choose “Deploy”. Or choose from the ribbon. 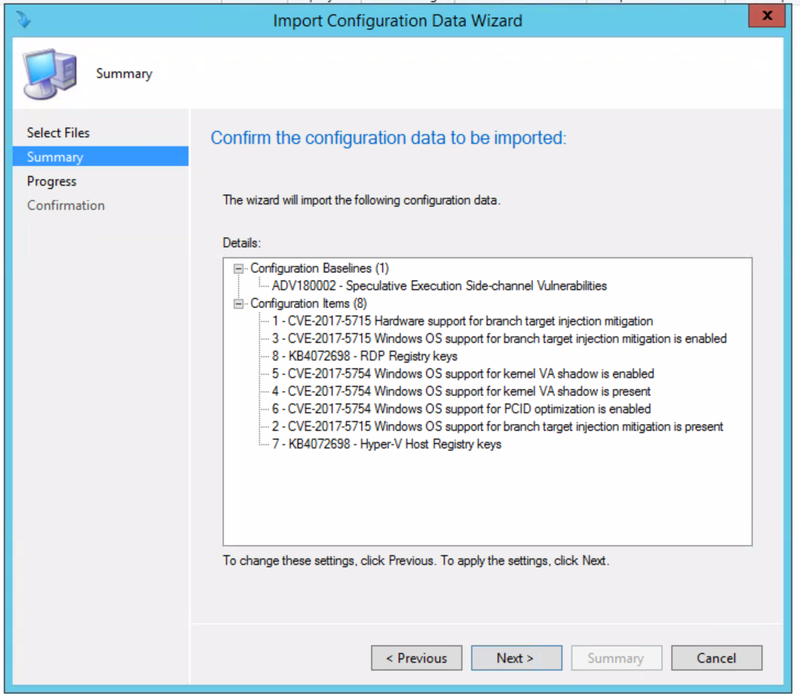 From deployment wizard, we have the option to check “Remediate noncompliant rules when supported” which will automatically remediate the registry entries, however, we will opt to deploy the registry changes via a task sequence and use this baseline for reporting only. Choosing this would automate the remediation within your maintenance windows, otherwise checking “Allow remediation outside the maintenance window” would allow for remediation sooner. The first part of the Task Sequence will be a “Check Readiness” to ensure the disk has at least 2GB free space and that there is an eligible OS installed. After you’ve deployed everything, head over reporting and look at “Compliance and Settings Management”. Depending on how you want to view compliance, there is an assortment of built in reports that should show you what you want to see. Visit the Firmware vendor list and find the vendor for which you need the firmware for. Once you’ve tested the firmware in your environment, package it up and add that to the task sequence as the last step. Maps to BTIHardwarePresent. This line tells you if hardware features are present to support the branch target injection mitigation. The device OEM is responsible for providing the updated BIOS/firmware that contains the microcode provided by CPU manufacturers. If this line is True, the required hardware features are present. If the line is False (update firmware), the required hardware features are not present, and therefore the branch target injection mitigation cannot be enabled. Maps to BTIWindowsSupportPresent. This line tells you if Windows operating system support is present for the branch target injection mitigation. If it is True, the operating system supports enabling the branch target injection mitigation (and therefore has installed the January 2018 update). If it is False, the January 2018 update has not been installed on the system, and the branch target injection mitigation cannot be enabled. Hardware support is not present. OS support is not present. The mitigation has been disabled by system policy. Maps to KVAShadowRequired. This line tells you if the hardware is vulnerable to CVE-2017-5754. If it is True, the hardware is believed to be vulnerable to CVE-2017-5754. If it is False, the hardware is known to not be vulnerable to CVE-2017-5754. Maps to KVAShadowWindowsSupportPresent. This line tells you if Windows operating system support for the kernel VA shadow feature is present. If it is True, the January 2018 update is installed on the device, and kernel VA shadow is supported. If it is False, the January 2018 update is not installed, and kernel VA shadow support does not exist. Maps to KVAShadowWindowsSupportEnabled. This line tells you if the kernel VA shadow feature has been enabled. If it is True, the hardware is believed to be vulnerable to CVE-2017-5754, Windows operating system support is present, and the feature has been enabled. The Kernel VA shadow feature is currently enabled by default on client versions of Windows and is disabled by default on versions of Windows Server. If it is False, either Windows operating system support is not present, or the feature has not been enabled. Maps to KVAShadowPcidEnabled. This line tells you if an additional performance optimization has been enabled for kernel VA shadow. If it is True, kernel VA shadow is enabled, hardware support for PCID is present, and PCID optimization for kernel VA shadow has been enabled. If it is False, either the hardware or the OS may not support PCID. 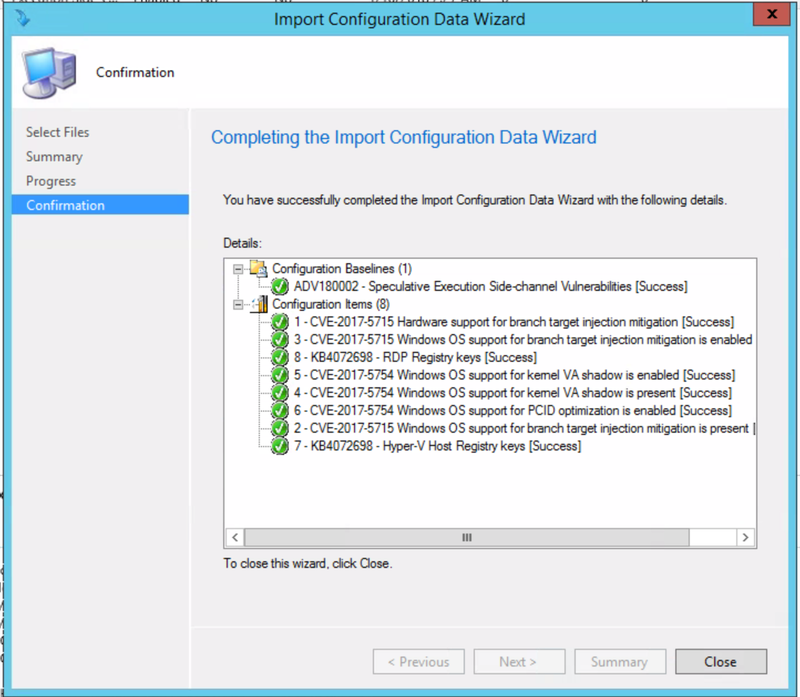 It is not a security weakness for the PCID optimization to not be enabled. BTIWindowsSupportEnabled: True -> on client, no action required. On server, follow guidance. KVAShadowWindowsSupportEnabled: True -> on client, no action required. On server, follow guidance.